Epic was ranked the most satisfactory EHR system in a survey conducted by Healthcare IT News. The survey, which polled IT managers, physicians and clinician end-users, measured EHR systems based on visual appearance, user experience, interoperability, quality of installation support, quality of ongoing support, and overall satisfaction. Epic averaged 8.1 out of 10 for overall satisfaction, beating competitor’s eClinicalWorks, Allscripts, Cerner, MEDITECH, NextGen, GE Healthcare, McKesson and Siemens. Survey respondents raved about Epic’s customer service support, but criticized it’s interoperability with clinical systems and billing systems. 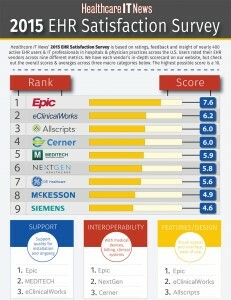 Advertised as the largest cloud-based EHR in America, eClinicalWorks took the number two spot in the survey. It ranked highest in Interface/User Experience, but lowest in Interoperability. Survey respondents noted its ability to meet Meaningful Use standards, but bemoaned its poor customer support. Cerner and Allscripts tied for third, with MEDITECH a close forth. Those polled ranked Cerner and Allscripts high for interface and visual appeal, but both scored low for interoperability and support. MEDITECH received opposite rankings, with high scores for its support but low scores for its interface. For complete survey results, visit Healthcare IT News.